The first of nine examples of the new Lamborghini Veneno Roadster supercar was unveiled in Abu Dhabi’s Mina Zayed port on Dec. 2. Powered by a 750-HP engine V-12, the new Italian extreme supercar can hit a top speed of 355 kmh and accelerate from 0 to 100 kmh in 2.9 seconds: a performance worth of a fighter jet! For this reason, the public debut of the new 4.5 million USD Lamborghini took place on a quite unusual place: the deck of the Italian aicraft carrier Cavour that left Taranto on Nov. 12 on a scheduled cruise, whose main purpose is to promote the “made-in-Italy” technologies in the Gulf region and in Africa. 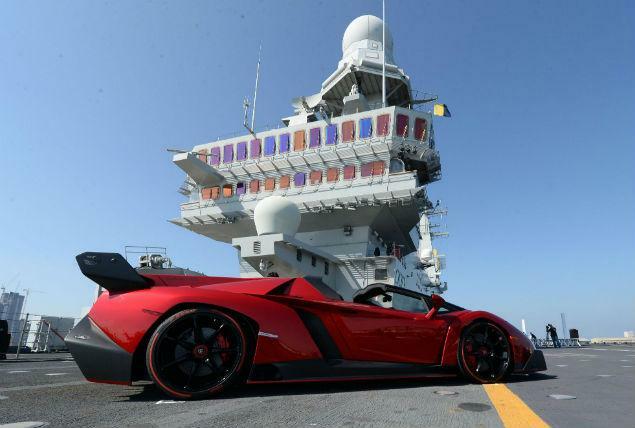 Some cool images of the Veneno Roadster next to the Italian Navy‘s AV-8B+ Harrier were released by Lamborghini.